On a Sunday not long ago we gathered in Chicago to attend the wedding in a beautiful loft not far from downtown. The ceremony was personal and fitted the bride and groom to a tee-touching, warm, full of love, all the things I presume they wanted their day to be. They are so obviously in love and it’s clear that for them there was no greater gift in the world than be joined to each other for the rest of their lives. They are a perfect pair. After the ceremony and brunch, did I mention we were all going to a baseball game?? At Wrigley Field? From the reception to the ballpark we did go. And what about the weather, you say. It was sunny and hot. Isn’t that grand for there are many kinds of weather that could visit a July day. Off we go, some two dozen of us and we are seated in the Budweiser Bleacher Seats Patio in right field. This space will seat approximately 60+ people and when there you can eat as much baseball food and drink as much beer (Budweiser of course) or soda as you’d like for the duration of the game. The patio was not full and our group pretty much had the run of the place. There was another group of about 10 but they only watched the game for a short time and then seemed more intent on keeping hydrated with beer. The fact that we had many options of where to sit figures into the odds scenario. The guests and and the bride and groom moved about on the three levels of the patio throughout the game between the Chicago Cubs and Atlanta Braves. 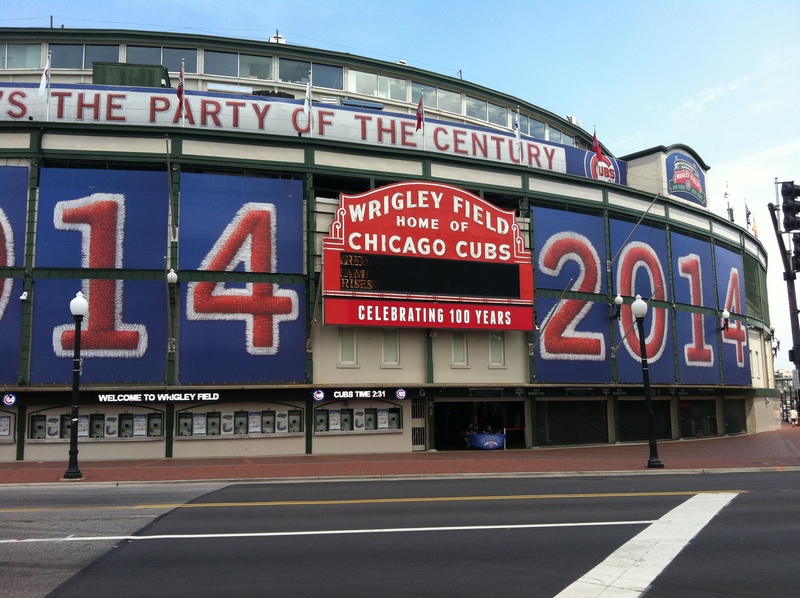 There was the atmosphere of Wrigley Field and the joy of the day that was washing over us. The Cubs were losing, we were talking, some of us watching the game closely, some not so much and then a rookie for the Cubs, Alcantara came to bat. I was talking to another guest and he, with one eye on the field, said “Watch for it! Watch for it!”. When you clink this link you will see Alcantara hit his first home run and the ball, as if set on a laser beam flies into the Budweiser Patio and to the young man, the groom, who was married only a few hours before! A perfect pair, a perfect day. And really, what are the odds a rookie major league baseball player would hit his first homer to a man (a huge baseball fan) on his wedding day. This is a fabulous story!! And true, too!! Really hard to believe! Thanks for sharing the story and the video! Isn’t it just the best. Our sister, the bride’s mother who died ten years ago would have been so in her element the whole day. She too was a baseball fan and would have soaked up every minute of that perfect day. That is so fantastic!!! I love it!! They say truth is stranger than fiction. In this case if you created this story as an author, some might say ‘ah come on, what are the chance of that happening’. Well, whatever the odds are, it did happen! What an awesome story! Their smiling faces tell the whole story! Congratulations! So glad to hear everything was so perfect! It was a wonderful day for them and for all of us. Thank you! What a great story! I enjoyed reading your blog and the watching the video. You look beautiful in the silk blouse. Thank you. And thanks for designing and creating the silk blouse. Saw the news on Arden’s FB page but missed your post until now. 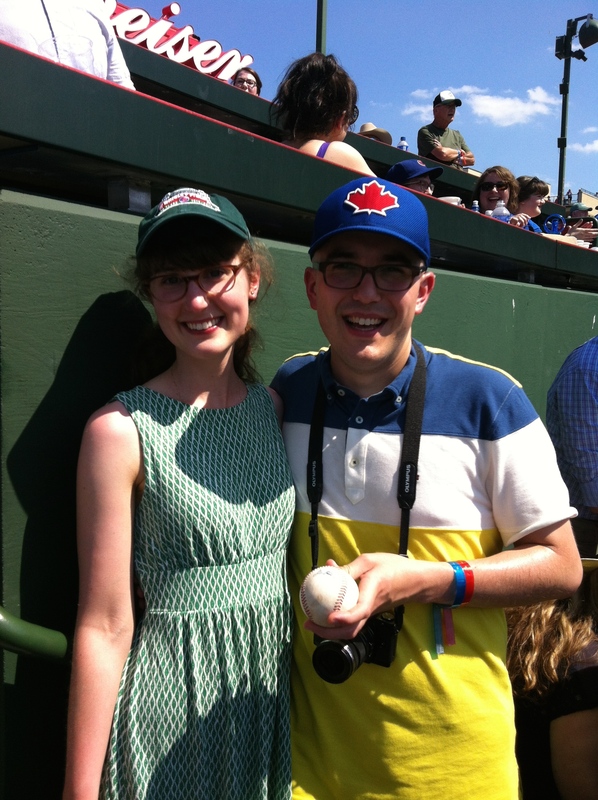 Pretty neat wedding gift – a home run ball in Wrigley Field. Indeed, what are the chances.